I once visited Czech Republic’s second city, Brno. It is largely ignored next to big brother Prague, yet has some beautiful architecture and very friendly welcoming people who are not so fatigued by an endless onslaught of tourists as is the case in the capital. Although I was there to visit a new school, I was told I simply had to visit the Capuchin Crypt on Capuchin Square near the Cabbage Market. What I encountered there was not entirely what I had expected. Don’t get me wrong, I’m a huge fan of architecture, and the Baroque churches across Czech Republic, as elsewhere, boast some of the finest examples. The issue was more with the very-much-on-display contents of the crypt. Thanks to a rare permutation of natural ventilation and a particular soil type, it became apparent many years ago that when the dead were laid to rest there, their bodies did not turn to bone as usual, but rather were mummifying. All fine and good. A curious quirk of nature. And entertaining as Indiana Jones and the Temple of Doom may be in the comfort of a warm cinema and good company, when you’re in a real crypt, with dim lighting and that cool mummifying air whispering down your neck, and all the other visitors leave so that you’re the only one there, suddenly the reality of being outnumbered about 80 to 1 by the desiccated dead with contorted faces screaming silently at you, becomes the stuff of horror films and your worst nightmares. Needless to say I paid my respects and scarpered. If you, like Richard, are planning a visit to the Czech Republic, why not learn Czech with Cactus? I had the chance to spend a whole week here, not only as a tourist, but as a student of Arabic. I have been learning Arabic for a little over a year now. I first started studying in England, through Arabic evening courses, once a week. These courses taught me the basics, to be able to understand basic conversations and to read and write Arabic. I then decided to go to an Arabic-speaking country to improve my language skills and put them into practice with local people. To my surprise, people could understand me, better than I had anticipated, and I was able to have daily interactions with the locals. I choose Morocco because I fell in love with the country and its people from the first time I visited. It’s in their nature to make you feel welcome and to make you want to stay there FOREVER. The week in Marrakech and the Marrakech school exceeded my expectations completely. The staff was so nice and welcoming that I wish I could have stayed longer. The school is in a very nice area in the new part of the city – very easy to reach from the accommodation options they offer. I chose to stay in an apartment, but with hindsight I think the option of staying with a host family would have made my experience even better. Maybe next time – as there will definitely be a next time! My teacher was always very well prepared for the lessons and the method he used was a very communicative. I have never before spoken so much during classes. His English was really good, but we mainly spoke in Arabic. The classrooms are equipped with screens and other interactive materials, used to introduce the topics. This made the lessons fun and effective. I much preferred it to following a book. The 2 hours of lessons a day went so fast through learning new vocabulary, putting it into practice, playing games to practice, and creating my own texts with my own experiences. We also worked with short videos that were used as prompts for us to speak and use the language we were learning. The lessons were complemented with other activities such as Henna seminars and cooking classes, which are an amazing way of getting to know the culture during the course. The progress made by going to the country where the language is spoken cannot be measured. It’s something absolutely necessary if you really want to make quick progress and it’s not only about the language, but also about immersing yourself in the culture and customs. As a female travelling on my own in Morocco, I felt completely safe. It is true that men approach you and try to speak to you, as they can tell you are not local. It can happen quite a lot, to the point that it can get annoying. This happens especially in the tourist hot spots such as Marrakech, Fez, and Tangier. If you travel to cities like Rabat or go to the dessert, it is not so bad. There is no reason to be scared though, this sort of behaviour is very common in the Mediterranean. In Morocco you have to add the fact that local women will not talk to men they don’t know on the streets, so they target foreign women. If you are in the souks, most of the men just want you to buy their tea pots, spices, souvenirs, etc. To avoid being bothered, you just keep on walking and don’t respond, same as Moroccan women do. On the other hand, the souks are a good place to practice Arabic, and when people see you speak the local language, you always get better prices! People are generally very nice and welcoming, and as long as you treat them with respect, you should have no problems at all. Just be aware and, as in any other place in the world, it’s always best to go exploring accompanied by other people, especially at night. All our London language courses will take a 2-week Olympics break from Fri 27th July – Fri 10th August. As we all know, it can be a nightmare getting around London at the best of times and according to recent Transport for London adverts, this is set to only get worse during the Olympics, affecting both public transport and roads. We’re therefore taking a 2-week Olympics break – so whether you’re staying to watch, heading for the hills, or have been lucky enough to secure some tickets – you won’t lose out, have to miss any lessons or get hot under the collar trying to fight your way through the crowds to get to us. All London courses will ‘resume normal service’ from Sat 11th August and will run for an extra two weeks to make up for the break. So you get the full course you paid for, without having to compete for a seat on an overcrowded bus or train or miss your favourite event. 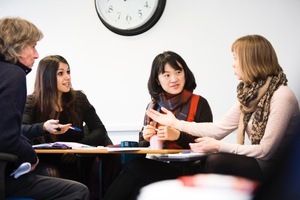 Book your language course in July with confidence, knowing that we’ve got you covered! *Applies only to Cactus students, no guarantees can be made for Team GB. We would however like to wish all athletes the best of luck! With one 2-hour class per week, from 6.30 to 8.30pm, you can easily learn a language after work. Get started now and you could be speaking a new language in time for this summer, by the end of June to be precise. Language courses available in Canary Wharf include Arabic, Chinese (Mandarin), English, French, German, Italian, Japanese and Spanish. Courses start from £205 including book and are taught by experienced teachers in small interactive, sociable groups. They run on different nights of the week and start quarterly form 17th April. Book early and you can get £10 off! To find out more visit www.languagecoursesuk.co.uk or call 0845 130 4775. For previous Canary Wharf students, this move will affect only the location of their course. All other course details, e.g. days and times, remain unchanged. Why are the Canary Wharf courses moving? We have appointed a new centre in Canary Wharf, based on feedback received from our students. During each course we ask for your comments via questionnaires. Your input actively shapes not only the course you are on, but our future course offering. We would like to thank everyone who submitted feedback or took part in our survey for helping to continuously improve our courses. Cactus has 17 training locations across London, including Baker Street, Bond Street, Canary Wharf, Clapham, Gloucester Road, Greenwich, Highgate, Holborn-Russell Square, Islington, Kings Cross, Notting Hill, Oxford Circus, Piccadilly Circus, Shepherds Bush, Soho, Victoria and Wimbledon. Why not treat your Valentine to an experience they won’t forget this February? Instead of the usual clichéd hearts and flowers, surprise your loved one with Cactus lessons in the language of love! If you’ve always wanted to speak Spanish, French, Italian or German, now you can with our Cactus Language Training competition. We’ve teamed up with Cactus Language Training to offer to 1 goodtoknow user and a friend, a 10-week evening language course in either Spanish, French, Italian or German at a local learning centre. What better way to kick-start 2012 than by making a resolution to learn a new language? You’ll be taught the 4 key areas of speaking, reading, writing and listening, with help from Cactus’ friendly and highly-qualified teachers. And with a choice of 12 language levels and over 40 locations around the UK, there is sure to be a course to suit everyone. Every year Cactus helps more than 15,000 people learn over 30 languages in 60 countries and at 500 destinations worldwide. Cactus announces winner of Spanish Facebook competition! Cactus is delighted to announce that Chris Parker is the lucky winner of our hugely popular Spanish Facebook competition. Selected at random from 1,000 entries, Chris will be jetting-off with a friend for a fantastic two-week break at the prestigious Malaca Instituto in Malaga next year. Well done Chris – and watch this space for more competitions! http://www.cactusworldwide.com/blog/wp-content/uploads/2011/11/FullsizeTweetLogo_thumb.jpg 152 182 Sarah Watkins http://www.cactusworldwide.com/blog/wp-content/uploads/2013/07/cactus-blog1.jpg Sarah Watkins2011-11-09 11:24:522013-07-12 13:00:43Cactus announces winner of Spanish Facebook competition! Cactus is the UK’s biggest provider of face-to-face language training, helping over 15,000 people every year learn more than 30 languages in 60 countries worldwide. Choose from an extensive range of evening and part-time courses across the UK, or jet-off abroad to learn the language in situ instead. Whatever the right language learning solution is for you, you are likely to find it at http://www.cactuslanguagetraining.com. To help get your language learning ambitions off to a flying start, Cactus is offering readers of Monarch Explorer the chance to enter a fantastic competition to win a 1-week intensive Spanish course for two people in Malaga at the renowned Malaca Instituto!